Did you know that you can extend your iPhone battery life just a little bit longer by using the Low Power Mode? As part of the iOS 9 upgrade, iPhone users will automatically get a prompt to activate the Low Power mode when the device reaches 20 % of battery life. But what does the Low Power mode do? Here are the details. When your iPhone reaches 20 percent battery power, a Low Power Mode prompt will show up on your screen. Your iPhone will then list out the features will become temporarily disabled. If you choose to select the Continue option, low power mode will become activated. You can also choose to cancel the option to prevent it from getting activated. Note: The Low Power Mode feature is only available on iPhones. It does not work on iPads. In Low power mode, you iPhone can give you anywhere between 1 to 3 hours of extra battery life before exhausting its battery life. If you want to activate low power mode even before it reaches 20% battery life, you can customize the settings to do that too. 2. Scroll down and tap Battery. 3. Toggle the Low Power Mode slider to activate it. Notice how the battery indicator in the status bar turns yellow. This is an indication that low power mode is enabled. 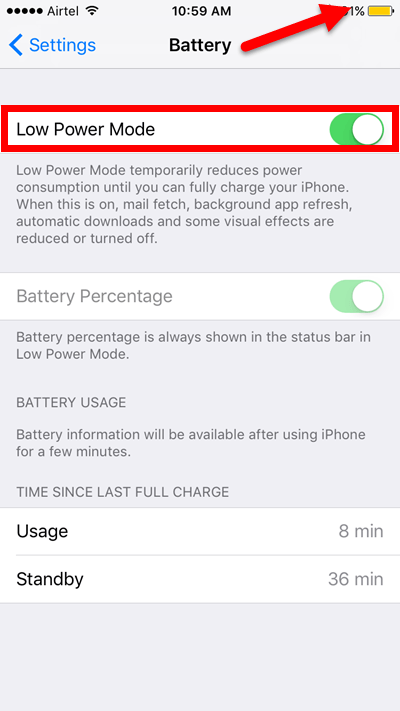 Once your iPhone is charged to a certain level, the low power mode will become disabled. This is just a temporary feature that lasts until the next proper charge. Low power mode automatically disables or changes a bunch of settings in order to save battery life. For instance, in low power mode, new mail will not be automatically fetched. The screen brightness will be slightly reduced and the screen itself will get locked and powered off faster than usual. 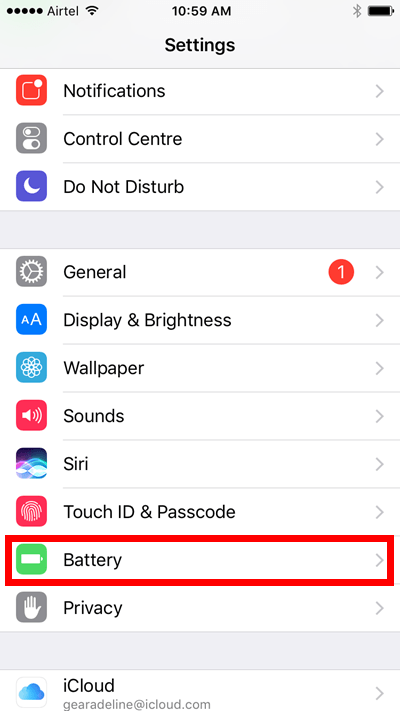 Even the apps on the iPhone can detect when low power mode is enabled and will disable animations and other battery-sucking features. If you have motion effects and animated wallpapers, they will also be disabled. Any background activities and networking will be paused to avoid unnecessary battery drainage in the background. The CPU and GPU performance of your iPhone will also be reduced and you will notice a slightly slower performance of your phone. The Low power mode feature is quite aggressive, which is why it is not recommended to be used all the time. 1. App Usage: You first need to find out which apps are using most of your battery power. To do this: go to Settings->Battery and adjust the settings of the respective apps according to your usage and consumption. 2. Mail Fetching: If you have email accounts configured to fetch new email every few minutes, your iPhone is going to turn on and do work in regular intervals. You can head over to your Mail settings and reset when new email should be checked. Or you can completely disable it and check new email manually. Disabling the feature will mean you no longer see new email notifications so keep that in mind while tweaking this setting. 3. Screen Brightness: If you don’t have auto brightness set on your iPhone, do it now. This will ensure that your screen is not too bright when it doesn’t deserve to be, thus saving power. You can also manually adjust the power from the Control Center. 4. Auto Lock: Go to Settings->General->Auto Lock and set the time for auto lock to a very short time, as little as 30 seconds. This way, your device will turn off the display faster saving you battery life. 5. Background Refresh: If you are not using any apps, you can save battery life by preventing them from getting automatically refreshed in the background. Settings->General->Background App Refresh. You can disable this for all apps or for individual apps. Disabling or tweaking the above mentioned settings will reduce the work your iPhone does and thus save on your battery life. You don’t have to actually apply these settings on a permanent basis. Just plan your usage if you are going to be away from your office desk or a power source for a very long time.